I will review PDFtk Pro, the perfect complement to Foxit PDF Reader, in this article. PDFtk Pro allows users to quickly split, merge, rotate, watermark, stamp and secure PDF files. The PDFtk Pro GUI has a limited number of settings that makes manipulating PDF-files really easy. In my personal opinion it is the Swiss army knife among the PDF Toolkits. I will cover each of the PDFtk Pro building blocks and its features in the following sections. First step is to add input PDF-files, via the add PDF-button on the left. You can copy or remove selected input PDF-files and order the input PDF-files via drag-and-drop. Their pages will be copied and merged to create your new output PDF-file. This approach gives extreme flexibility to quickly split and merge pages from one or more PDF-files, which I haven’t seen at any other PDF creator. Second step is to configure optional processing features for the output PDF-file. You can see 4 buttons on the left in the middle section of the PDFtk Pro program window. In the PDFtk Free version it is not possible to set the optional processing features ! You can select and configure none, one or more of these optional features via one-button click. PDFtk Pro allows you to watermark the output PDF file, for example as draft or final. You need to select an input PDF-file, from which the first page will supply the watermark/stamp content. Surprisingly it is not possible to select a single picture to watermark the output PDF file. However I will create a few watermark PDF files to be able to quickly watermark with PDFtk Pro. PDFtk Pro has an advanced button in the optional processing block. This button unlocks a wide variety of (advanced) command-line options. You can find a complete overview of the command line options on the PDFtk Server Man Page. Examples can be found on the PDFtk Server Examples page. “Encrypt a PDF using 128-bit strength (the default), withhold all permissions (the default) will look like pdftk 1.pdf output 1.128.pdf owner_pw foopass." 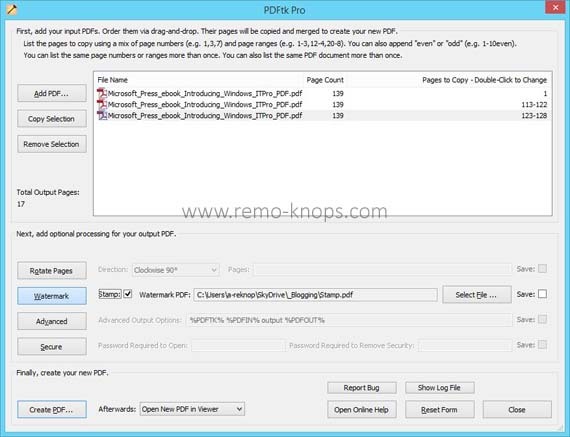 PDFtk Pro allows to protect the output PDF-file. You can set a password to open the output PDF-file or set a password to remove security settings for the output PDF-file. My default option here is to open the output PDF-file in Foxit Reader, so I can view/check the output PDF directly. PDFtk Pro has a simple graphical user interface, but provides an extensive set with options to create an output PDF-file. The command-line options described on PDFtk Server Man page, gives endless flexibility in how to create, split, merge, rotate, watermark and sercure a PDF-fle. PDFtk comes in a free version as well. PDFtk Free has all the options of PDFtk pro, except the optional processing features. However for the fair price point of only $3.99 I would advice the PDFtk Pro version. Overall PDFtk Pro is the Swiss army knife among the PDF Toolkits. Hey!, I found this information for you: "PDFtk Pro – Review of an excellent PDF Toolkit". Here is the website link: https://www.remo-knops.com/4836/pdftk-pro-pdf-toolkit/. Thank you.